Hollywood is making up for last month by opening a slew of box office marquee selections as summer has officially arrived. 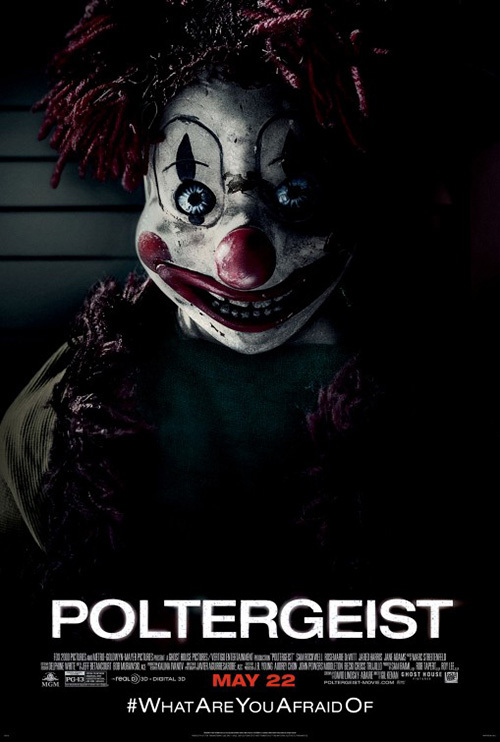 There’s a little something for everyone too—even a horror film if a remake of Poltergeist (opening May 22) can get you excited. I guess we’ll soon find out if its latest iteration of the creepy doll motif can lure in paying customers. Here is a case of “do what you can”. Or at least I hope that’s what happened. 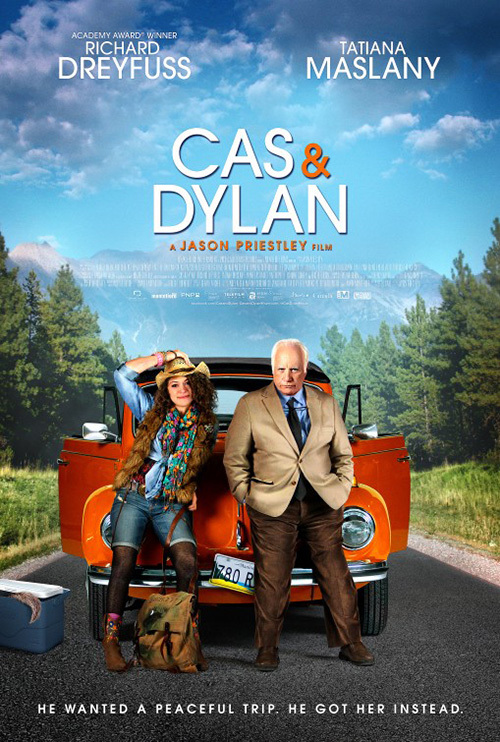 DOG & PONY‘s poster for Cas & Dylan (limited May 1) seems to have been cobbled together from whatever was at their disposal. Have a photo of the car driven in the film? 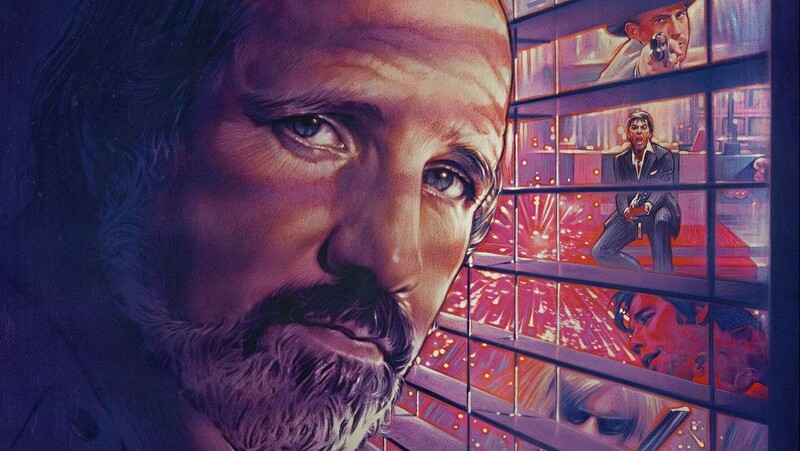 How about Tatiana Maslany and Richard Dreyfus‘ faces? I say faces because the rest of their bodies look cartoonish at best. The background isn’t even real. There’s a distracting white cloud of overlay behind the car (to make the white text pop more?) that makes the landscape look like a JC Penney photo department backdrop. And I know it’s a small, innocuous detail, but the fact the road is only one lane is unfathomably irksome to me. But maybe that’s just my being used to I-90’s multiple lanes on the east coast. If this were advertising a stage show where the actors literally stand inside a two-dimensional car façade and playact their journey, I’d say bravo. 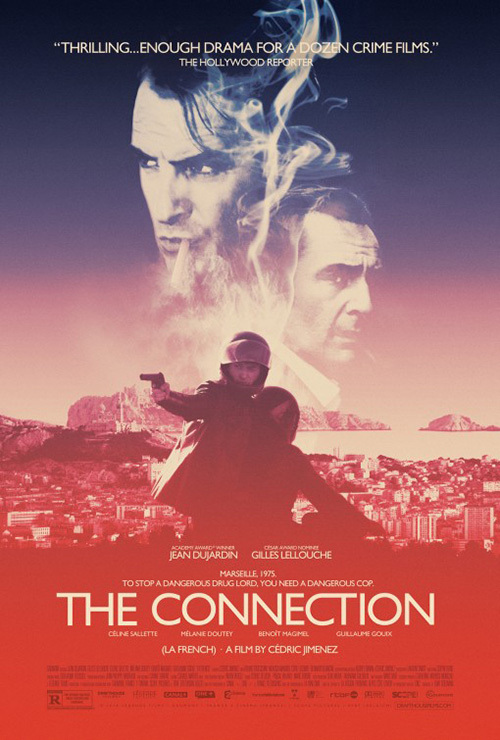 Since it’s a feature length film getting a theatrical release—albeit small—I must blame the producers for failing to assume a poster would be necessary. I understand not being able to afford a post-production publicity shoot, but at least take a couple set shots in anticipation of marketing. DOG & PONY would have been better off using a film still so its multiple parts looked like they belonged. Just one still, though, because the whole boxy collage theme is obnoxiously combative to its own needs. Look at BLT Communications, LLC‘s Aloha (opening May 29) to see what I’m saying. Should we look at Bradley Cooper? Rachel McAdams? Emma Stone? How about the amazing expanse of Hawaiian Islands made to look small and pedestrian by shoving it into a tiny corner? And the radial compartmentalization—is that a play on the name? 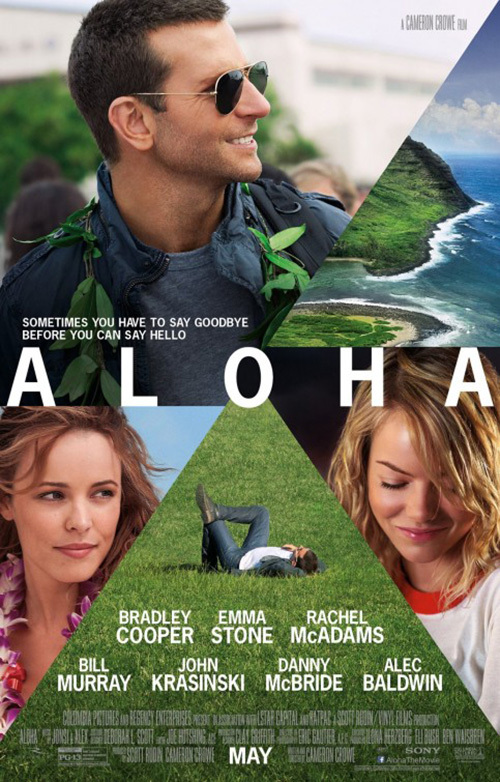 If so I’ll share a slow clap of approval for taking “Aloha’s” mirrored meaning of “Hello” and “Goodbye” to a full circle metaphor. Why don’t the pieces fit, though? If you’re going to fan out from a central “O”, do it correctly. 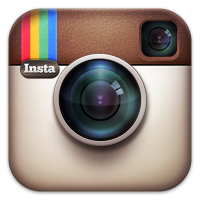 Or just use four photos so the weird extension past the pivot point doesn’t look arbitrary. It’s not like we needed two Coopers anyway. 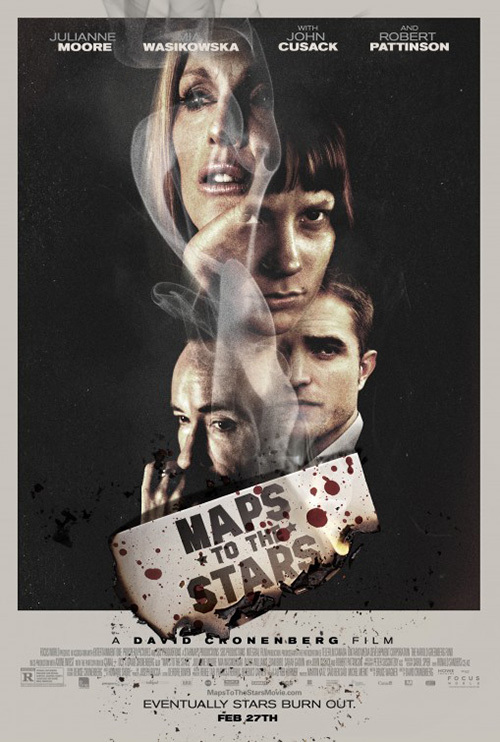 I may be completely fed up with the wispy totem montage being utilized every month (see Maps to the Stars), but The Connection (limited May 15) is light years better than both of these others. 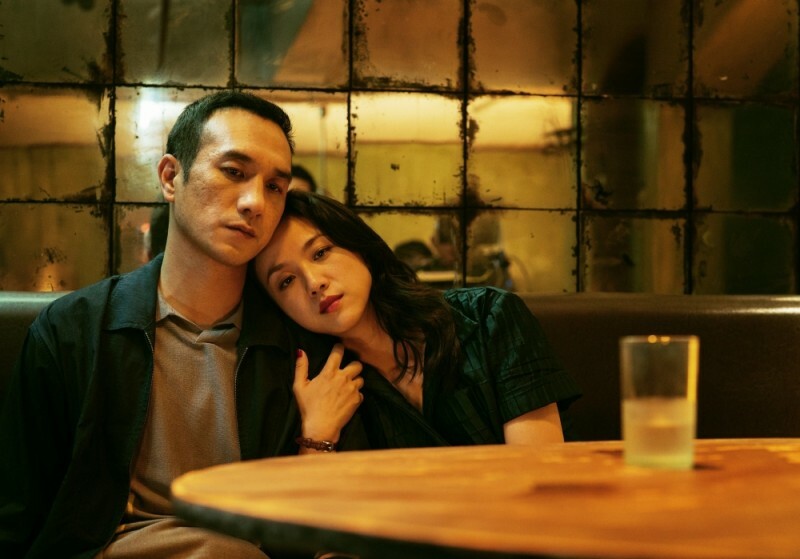 I think it has to do with the wonderful desaturation of color, stripping it of modern brightness and lending an old school feel for its 1975-set thriller. It might actually be better without those two floating heads. 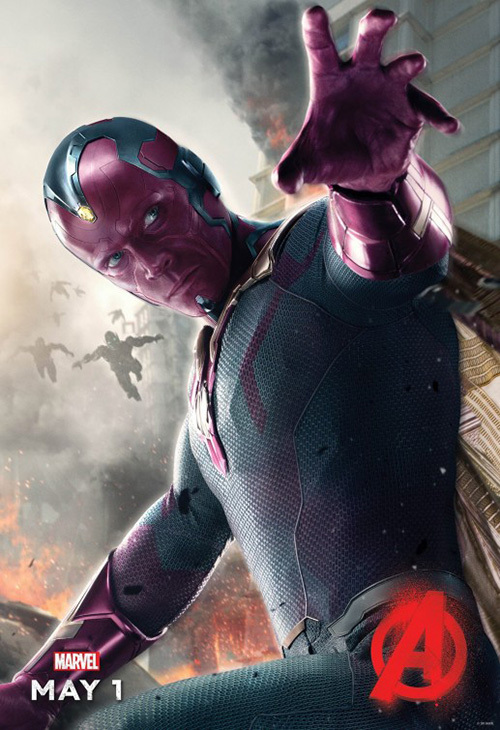 Give us the purple sky, empty above the squinting shooter on the motorcycle. Now that would be bold. Le Cercle Noir tried boldness but their stark white teaser is too plain. What’s happening? Did the bullet blow the other guy off his bike or is he flying to avoid it? Where is the context? I can see this as a black and white flier handed out after you leave the theater of another movie to whet appetites months before release. The firm did do much better with their European work (La French). I love the crop of Mélanie Doutey and its shallow focus. It’s very 70s and dramatic. It sets a tone. 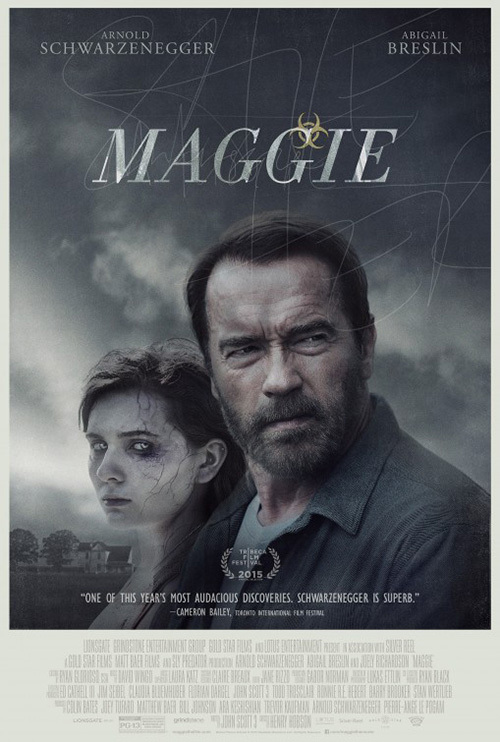 As for Maggie (opening May 8), there weren’t really any “pieces” to fit together in post. That’s not saying this isn’t a Photoshopped image of Arnold Schwarzenegger and Abigail Breslin, but if it is they did a good job. No, my inclusion under this banner was more a poor joke about Breslin’s face looking like a puzzle. Where the poster itself is concerned—I like it. There’s nothing new going on as we’ve seen the white Polaroid framing countless times and its lack of color for apocalyptic drama is old hat. 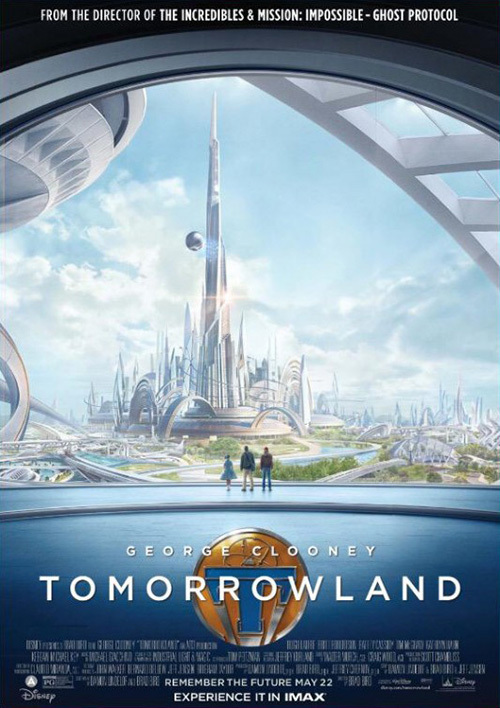 (Also, the radioactive logo being placed below the second “G” in the title with the only color in the entire poster is distracting in a bad way.) But you get the tone, star power, make-up effects, and flair nonetheless. My favorite part is the hand-scrawled “Save Her” cutting through the top half. 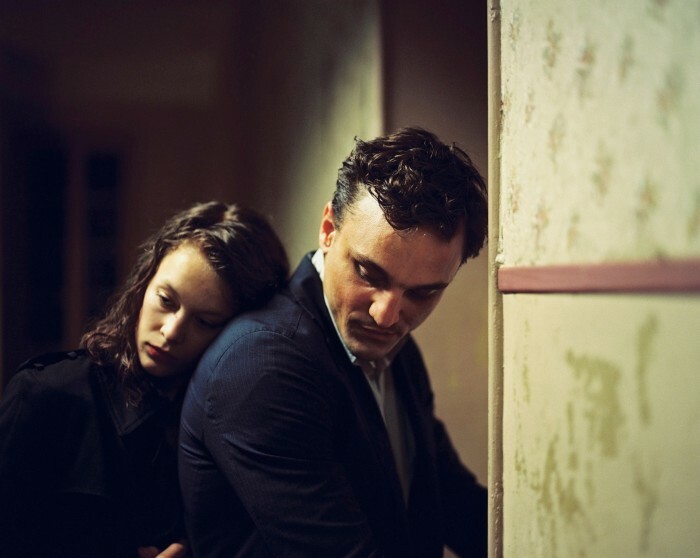 Similar to Endless Love, this one is much subtler and much more relevant to the idea. A father reminding himself to save his daughter no matter what is a powerful sentiment in a zombified future. A lot more than a spoiled rich kid angering her bigoted father by dating the kid from across the tracks. I love teaser sheets. LOVE them. 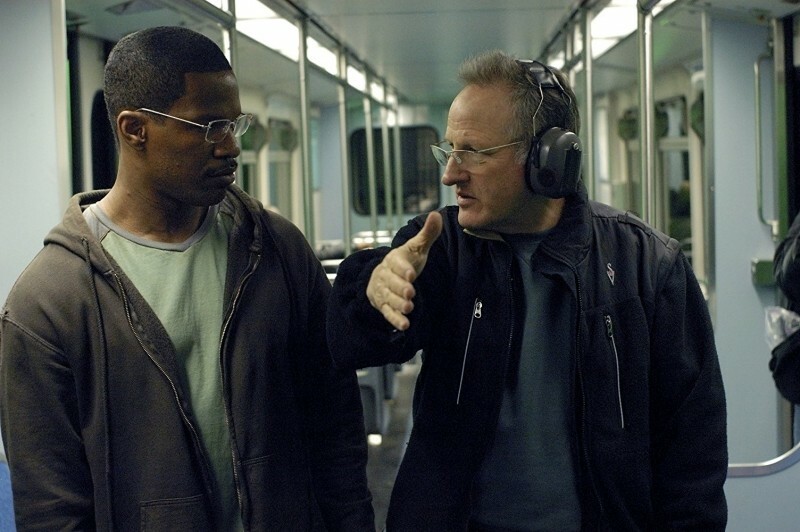 But I’m talking inventive, viral designs that put you into the movie and ratchet anticipation to the point of bursting. 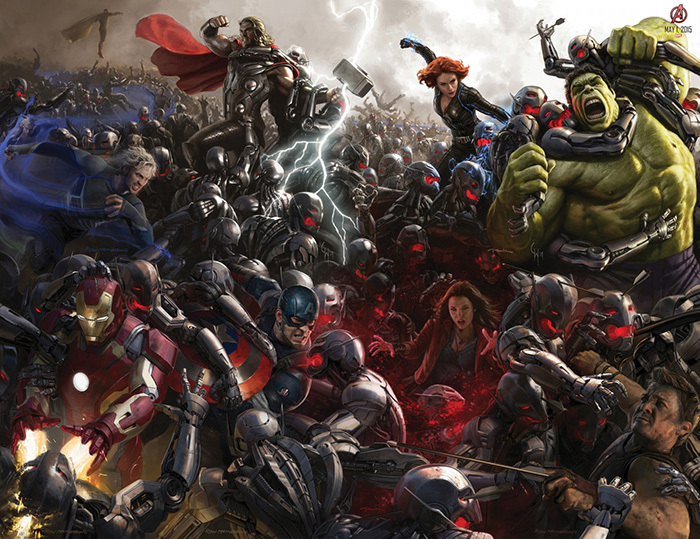 So I implore studios: please don’t make one for your movie unless you have something to show us. Sometimes a logo is good enough. Most times it’s not. 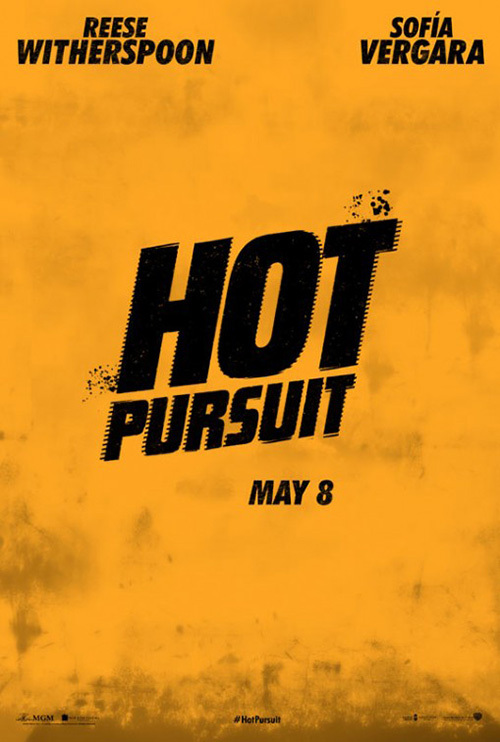 Case and point: Hot Pursuit (opening May 8). Why? Are we writing down dates in our calendar based on what we see on theater walls? Doubtful. The release date should mean next to nothing when the public doesn’t know the content. You’re supposed to be creating intrigue by coaxing viewers to find out more. And to many, seeing Reese Witherspoon and Sofía Vergara‘s names with nothing else will have them praying to never know anything more. 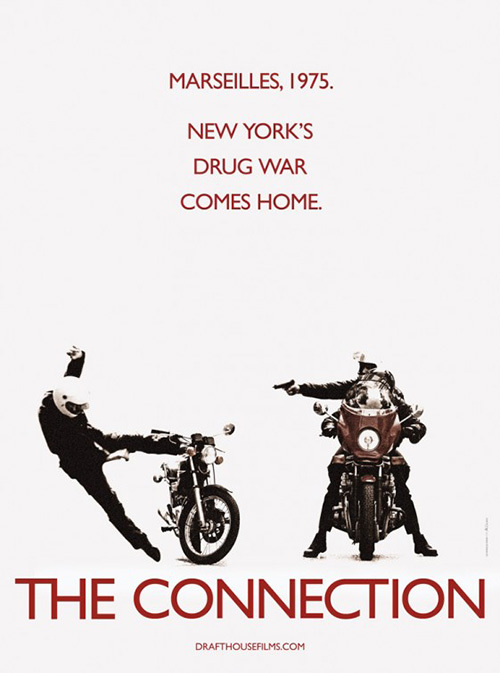 Not that a film like this needs a teaser when the final poster from cold open merely depicts the two women smirking at us. But then that appears to be a tease too with its “coming soon”. 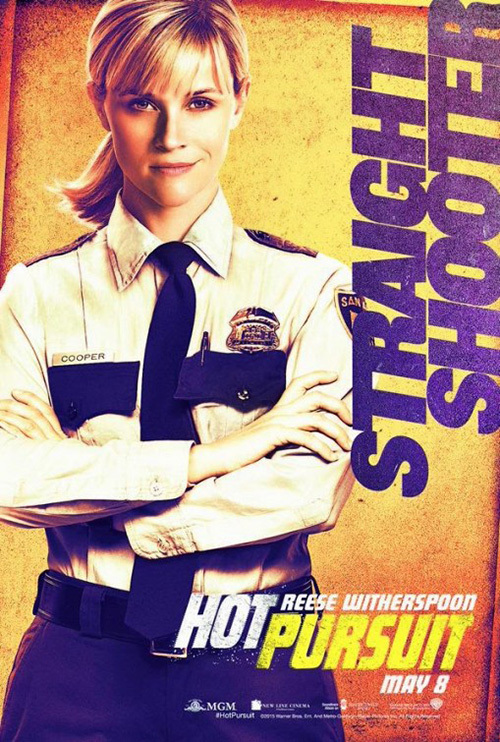 And is that really Witherspoon’s smile? I know she has a one-sided curl, but it looks like the designers drew it out extra long to compete with Jared Leto‘s Joker. I just don’t know what this campaign’s purpose is. Obviously Warner Bros. knows the thing will sell tickets on name recognition alone. 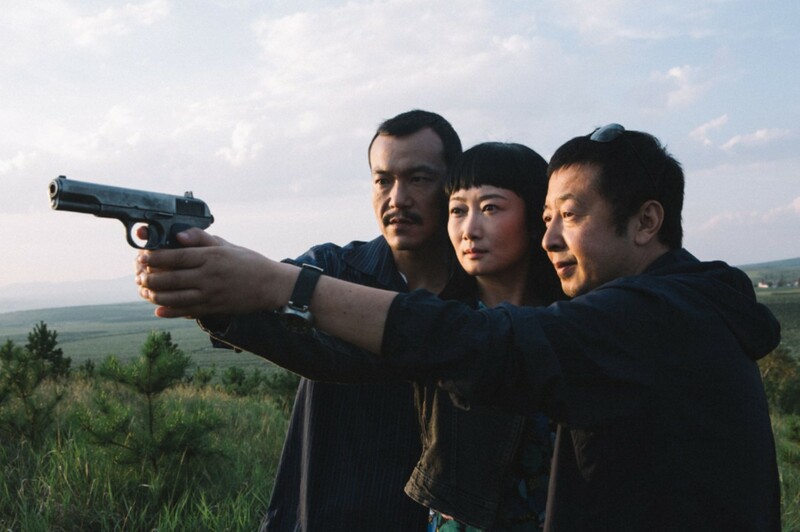 But give us something to sink our teeth into besides gritty color filters a la Expendables 3. 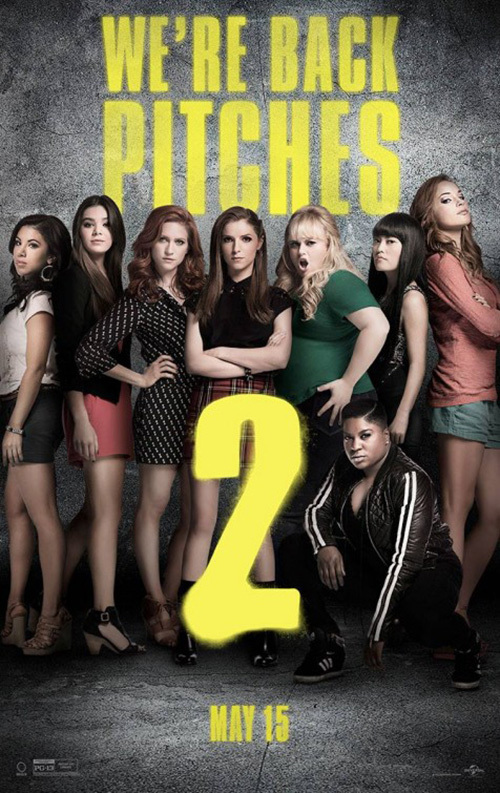 The same goes for Pitch Perfect 2 (opening May 15). The original was a surprise hit (and surprisingly very entertaining), but this one is a total moneymaking home run from the get-go. It’s hardly unique then that Ignition would hinge everything on its predecessor’s success. First comes Anna Kendrick and her cute little cup with the number 2 spray-painted on it. Subtle right? 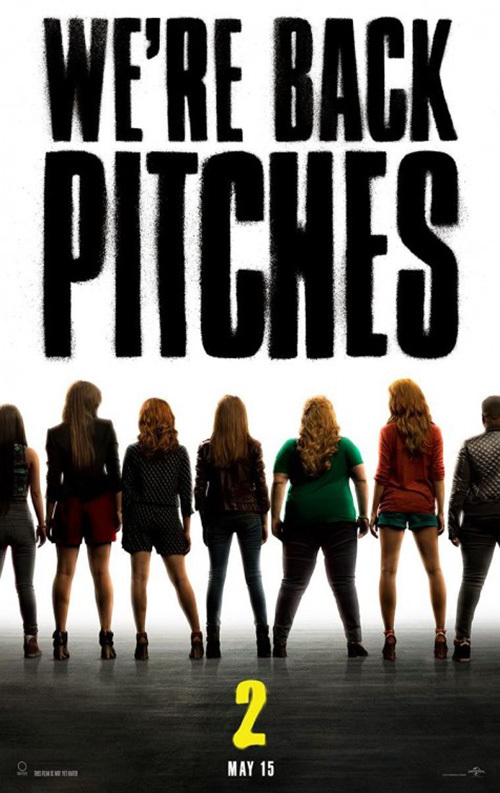 Next comes a blatant rip-off of the firm’s own poster for Pitch Perfect sans sunglasses and plus one Hailee Steinfeld. 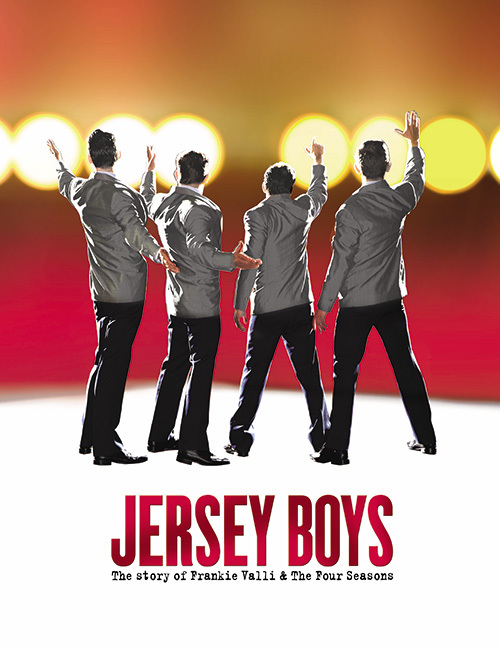 I can’t even say anything nice about BOND‘s attempt since it’s just a riff on the Broadway Jersey Boys graphic. Again, though—people are going to see this because they want to see it. Posters aren’t going to win over those who’ve been hiding under a rock for three years. That doesn’t mean you shouldn’t at least try. 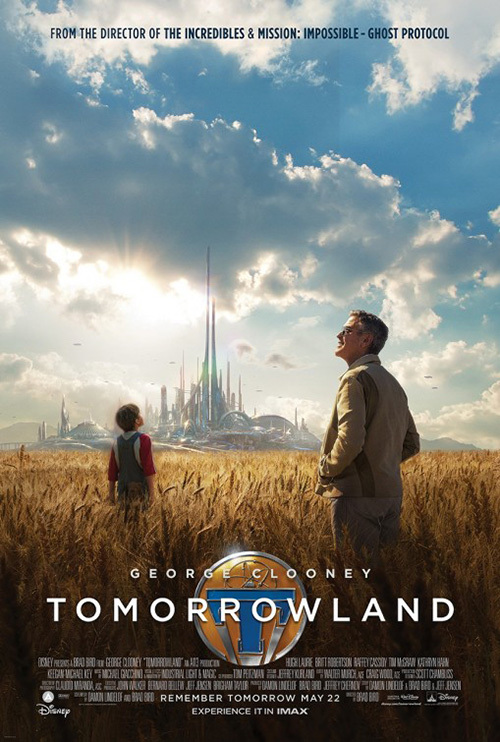 BLT tries with Tomorrowland (opening May 22). Or maybe they just got lucky by having a film with a cool design ripe for utilization. 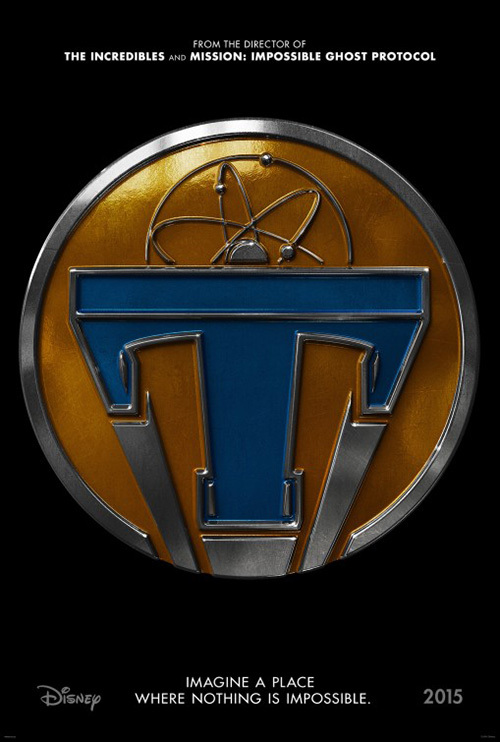 After all, if you’ve seen the trailer you know that a tiny pin transports the lead to a parallel universe. It’s a no-brainer to simply take that pre-conceived prop and focus everything its way. The object is already synonymous with the title and therefore easy to permeate our subconscious to stick. The firm is smart by including it on all other materials albeit smaller and behind the actual title now revealed. This first one is neat with its futuristic city in the background and expanse of cloudy dreamlike sky. Why George Clooney is looking in one direction and the little boy another is confusing, but there’s an aura of adventure and mystery that really plays. 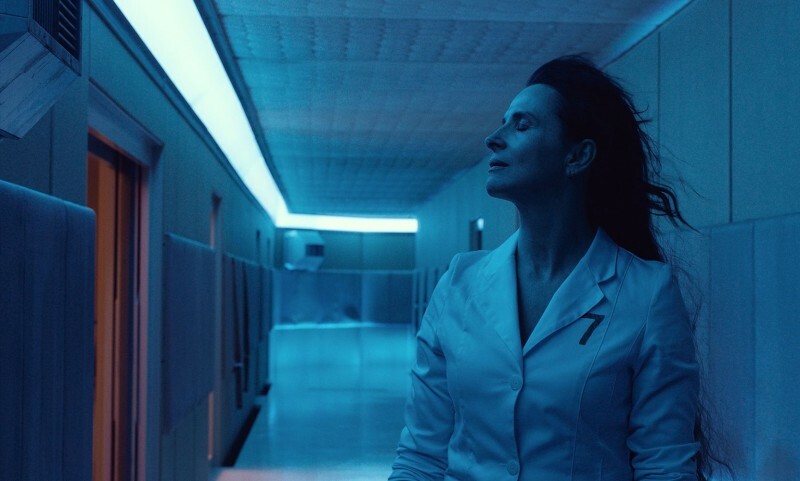 Definitely better than the clinical steely blue of Proof‘s sheet trying too hard to show a sense of scale when the film’s architectural design is paramount. As for BLT’s character sheets—yawn. The actors’ names aren’t even included. Neither are their character names. So what’s the point? 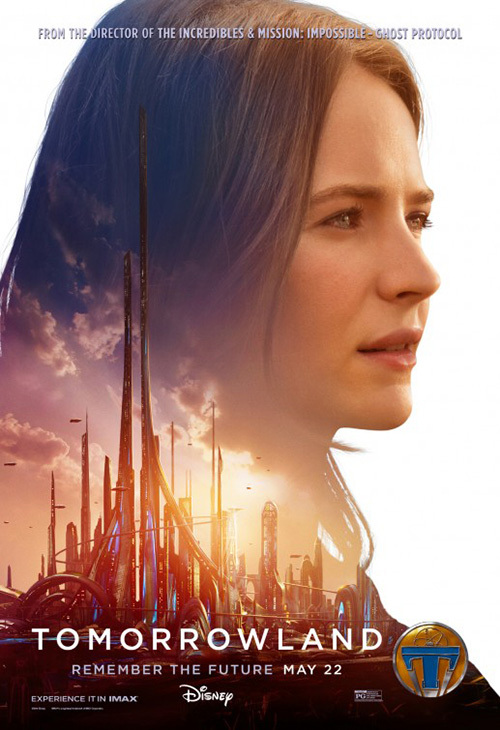 It’s not like the layout of blank faces against white with Tomorrowland’s buildings in the positive space is exciting. I look at them and think Disney had a quota to fill and this was the least time-consuming solution. 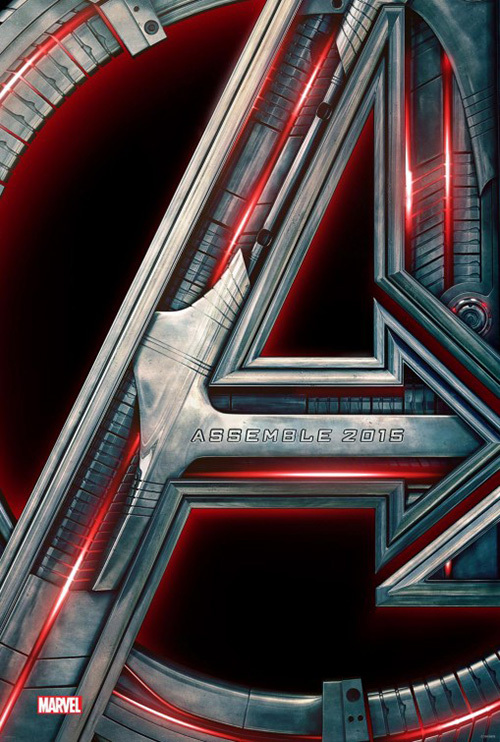 Similar to this teaser, BLT goes with a metallic insignia for Avengers: Age of Ultron (opening May 1) too. 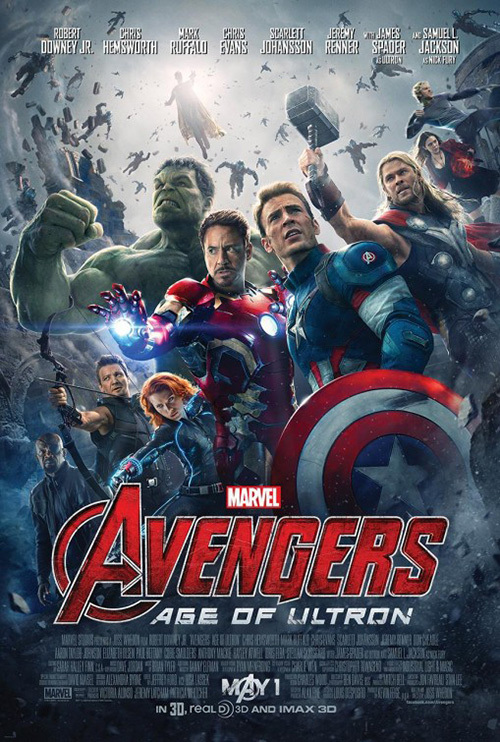 Itself a riff on their teaser for The Avengers, its robotics aesthetic is an obvious allusion to Ultron without showing the character. 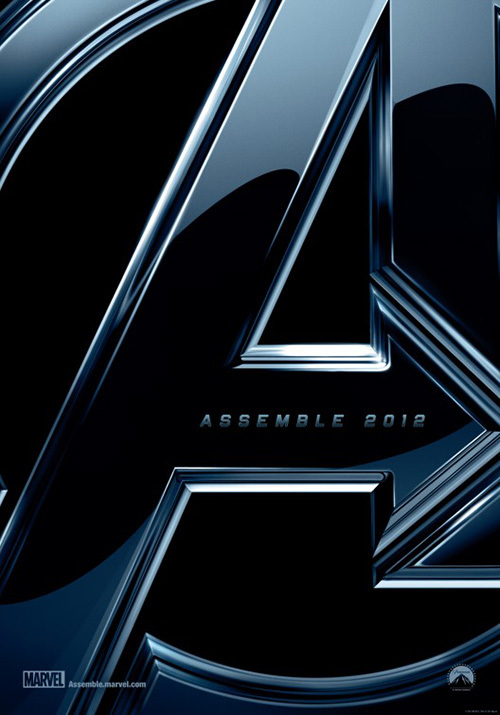 The tag is even the same “Assemble 20XX” to lend consistency and trigger the memory of seeing its original counterpart back in 2012. The final sheet with its circus of superheroes is exactly what you would expect, but it does have a welcome balance to not get completely lost on the wall. Would I want to bring it home? No. But as far as marketing goes, it does its job well thanks to the vantage point from below allowing everything to teeter on crashing down upon us. 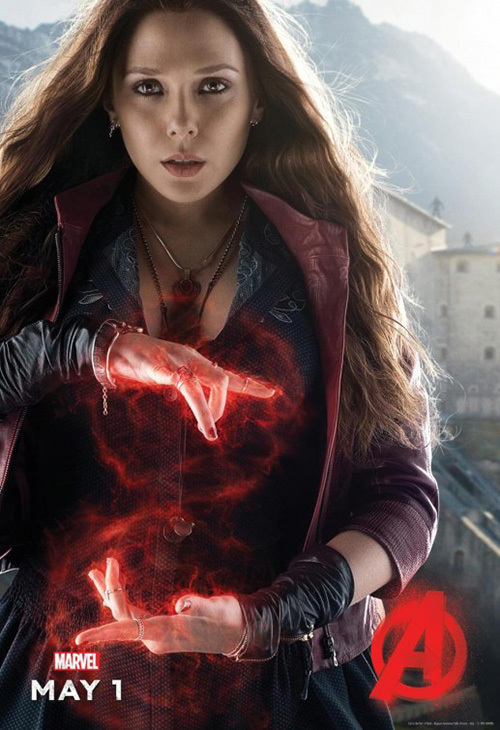 Where Avengers 2 really excels is in the character sheets. I like the one’s BLT did recently with the painterly depictions of heroes and villains underneath a grungy “A” because they come at dramatic angles with some cool effects. In contrast, I absolutely love the collector’s edition versions from way back when whether broken in six pieces or altogether in its chaotic glory. This is a comic book brought to life and a mural worthy of existing as a piece of art beyond commerce.